The levade is an ‘Air’ and the most collected movement a horse can do. Its original intent was for use in mounted war along with the rest of the ‘Airs Above The Ground’. The only places you’ll see it performed nowadays are at Equine/Military Schools such as the Spanish Riding School, in travelling shows, or exhibitions. Note the placement of the hind feet almost directly under the rider’s seat, how the long pastern is almost in line with the cannon bone, the hocks directly underneath the center of the haunch and lowered, and the horse ‘sitting down’. The horse holds and balances its weight throughout the big, powerful muscling of the haunch, while the hind legs/joints act as a coiled spring. While this takes tremendous strength to achieve, the horse has the advantage of using its entire body. 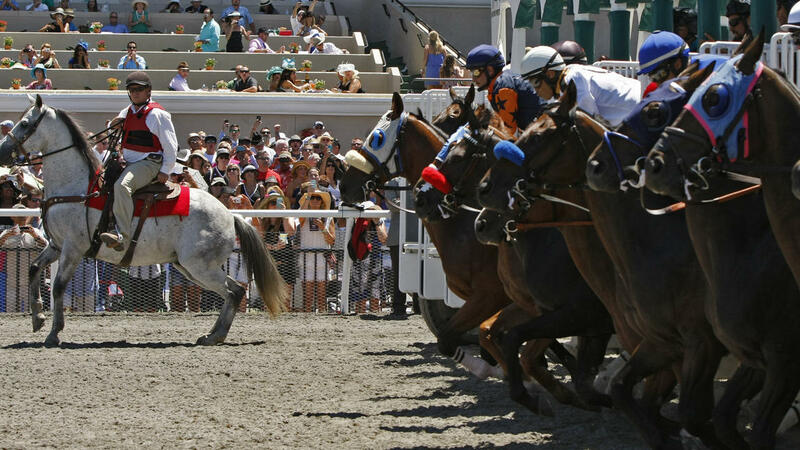 The next picture (taken from the LA Times earlier this month (click on photo to enlarge) – article about the current race season at Del Mar and the number of injured/dead horses – thanks, Trailrider, it really was an interesting article) is of a parade horse that’s gotten a bit excited as the other horses leave the gate. This is a rear, albeit a baby one. Note the placement of the hind feet (behind the stifle), and the placement of the hocks (behind the horse’s buttocks), how vertical the cannon bone remains while the fetlocks and hocks close, taking much of the pressure. 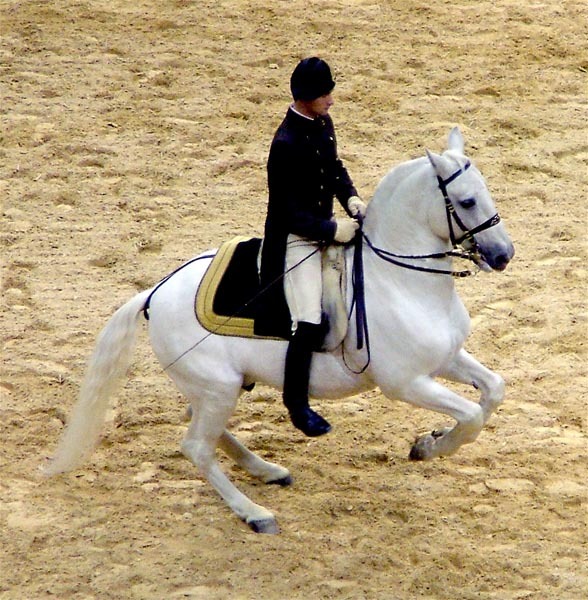 The majority of the horse’s weight is forward and down into the stifles. While the withers have raised, it’s only because the horse has left/is leaving the ground with the front legs, and in fact this horse has hollowed its back, dropped its base of neck and withers. Obviously the outrider at the track wasn’t trying to do a levade, and there’s no point in discussing the difference in rider position. Instead, these two pictures offer great comparison between what IS collection and what is NOT. I often hear from people how Dressage horses breakdown, specifically in their hocks. Well, people, that would be because the horse isn’t actually moving correctly. The horse isn’t collecting toward the goal in the first picture, but rather doing what the parade horse is doing. A horse ridden and trained correctly will benefit with increased soundness, not suffer from injuries.